I’m the DJ formerly known as Mynty Fresh and this is the first show of the new Film Den. I’m taking over for DJ Beaflix Kiddo. I’m reigning in the name down to DJ Mynt to suit this lovely new job. I’m going to be doing the Film Den a little differently than Beaflix so here’s the rundown. One to Two times a month I’ll have a guest on the show to do the classic countdown. The thing is, I don’t want us to run out of lists and I think we can do more for Laurier’s film fans so when I’m not listing the best college comedy films for you the show is going to look something like this. We’ll start off with some movie news. Going through the relevant news sites and bringing you best news coming out of Hollywood this week. Then I’ll take us through the box office results from the week before and the hopefuls for this weekend looking at Rotten Tomatoes for what critics liked and didn’t like about the films. For this summer we’ll look around the corner to the Oscars and I’ll tell you about one of the awards contenders for this fall. And then we’ll end off the show with what I’ve been watching this week and what you should put at the top of your to-watch list. 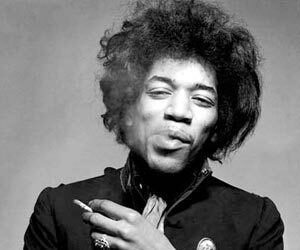 First up from Cinema Blend we’ve got some exciting news about Jimi Hendrix. There have been a few different attempts at getting a biopic of Hendrix off the ground and we’ve actually got two movies to show for it, the 2000 TV movie Hendrix and the 2013 attempt Jimi: All is by my Side. The problem? Neither film got the rights from the Hendrix estate to use any of the legendary guitarist’s music so the films were, shall we say, a little lacklustre. But it looks like Bourne Supremacy director Paul Greengrass and Legendary Pictures have finally figured out the licensing agreement with the Hendrix estate and a movie is on the way, though no timetable or casting has been announced. Also from Cinema Blend we have news that Natalie Portman might be taking acting seriously again. One of the most anticipated and celebrated films of the spring has been Alex Garland’s Ex Machina featuring Domhnall Gleason, Oscar Isaac, and Alicia Vikander. It’s a critical powerhouse and is being touted as a possible Oscar contender and so its exciting for fans of 2010’s Black Swan that Natalie Portman might be getting back in the game with Garland’s adaptation of Jeff VanderMeer’s novel, Annihilation. Since her Oscar win she hasn’t appeared in anything of note except the Thor films which are controversial among her fans so the return to more artistic film making is a welcome return. Finally we’ve got a bit of news from the land of Superheroes reported by Screen Rant. First, Hugh Jackman confirmed that he will be leaving the role of Wolverine after the upcoming sequel is completed. Rumours have been swirling for years that the veteran actor would be leaving the role but it looks like 17 years will be the charm when the final Jackman led Wolverine film lands in theatres two years from now. For the box office this weekend, Avengers: Age of Ultron will be looking to hold onto the crown and there don’t seem to be any contenders to challenge them. The only two wide releases are Arnold Schwarzenegger’s latest attempt to go dramatic, Maggie, and Reese Witherspoon’s action comedy Hot Pursuit. Hot Pursuit is sitting at a meezly 8% on the Tomato Meter with critics calling it everything from unfunny to just plain sexist, though the chemistry between Reese Witherspoon and co-star Sofia Vergara was held up as the only good thing about the film. Maggie on the other hand has divided critics at 52% on the Tomato Meter. Most agree that Arnold’s turn for the dramatic worked well and hailed Abigail Breslin as legitimately great in her role, but the tone and success of the film is disputed with some liking the Terrence Malick feeling of the narrative while others seeing it as a failed mashup.